The Samsung #GalaxyNote4 is one impressive device that not only comes with a powerful hardware spec sheet but also a big battery capacity. The #Note4 uses a 3220mAh battery that’s enough to last more than a day with moderate usage. On actual tests this phone is able to provide 28 hours of talk time, 11 hours of web surfing or 17 hours of video playback on a single charge. While the phone does not have any problem on its battery life some owners may experience no charging issues with their Note 4. The good thing is that we will tackle this type of issue in this latest installment of our troubleshooting series. If you own a Galaxy Note 4 or any other Android device for that matter then feel free to contact us using this form. We will be more than happy to assist you with any concern that you may have with your device. This is a free service we are offering with no strings attached. We however ask that when you do contact us try to be as detailed as possible so that an accurate assessment can be made and the correct solution can be given. Problem: I bought a wireless charging pad and the appropriate new back cover for the phone…..and it doesn’t charge when I set the phone on the little pad. …what am I doing wrong? Solution: There are many factors that needs to be checked on why your phone does not charge wirelessly. The first thing you need to check if the charging equipment first. In this case you need to verify that the charging cover and the wireless charging pad are indeed in good working condition. For the charging cover it would be best to use the Samsung wireless charging qi cover as this is designed to work well with your phone. It fits your phone well that all you have to do is snap it in then lay your phone on the wireless charging pad. Speaking of charging pads make sure to use a Qi compatible wireless charger. When charging you phone try to get the best position where your phone actually charges. This means you will have to move your phone around the wireless charging pad until you get to the sweet spot where your pone actually charges. If your phone doesn’t charge then take out the cover and reinsert it again. You should also make sure that the wireless charging pad is connected to a power source. Problem: When charging phone or connecting to laptop or PC to sync the phone will freeze and have to reset it just to get it to work but eventually will freeze again. Sometimes it happens right away or after a certain amount of minutes but it only does it with USB cable connected. It works ok when not connected to charger or laptop via USB. I have tried multiple micro USB cables, bought another oem charger and oem battery too just to see if it was battery and also done the wipe cache partition and user data and even a factory reset once it updated to lollipop 5.1.1 and still happens when trying to charge or hook up and sync to laptop or PC. I am thinking the micro USB port is issue but if you know of different solution to try I am willing to try it. Thanks. Solution: It looks like you have already done all of the necessary troubleshooting steps that can be done on your end without the use of special tools. It’s very likely that the problem with your phone is the charging port. There may be a circuit in your phone that gets grounded once you plug it in to charge thus causing your phone to freeze. I suggest you bring your phone to an authorized service center for further checking. Solution: The Note 4 has a water damage mark that indicates if the device has come into contact with water. This water damage mark is located in the middle of your phone housing and is a small white square with a purple x on it. If the white square has turned red or purple then your phone has sustained water damage. The technicians who checked your phone probably saw this. What you need to do is to bring your phone to an authorized service center and have it repaired. Some components inside your phone that controls the charging system may need to be replaced. Problem: Fast charging is not completely stopped working… It takes 4 to 5 hours to charge ….. Please fix it ….. I am fed up with this slow charging…. It shows fast charger connected but it’s still charging very slow …. Please fix it as soon as possible. Related Problem: Hey i am having some issues with my galaxy note 4…Actually fast charging doesnt work. it’s been only 1.5 months since i bought it. Then suddenly from yesterday my charging was too slow. Charge trickle sound comes and goes notifying Like charging, not charging, charging not charging even though connection to electricity is fine. what should i do please help me out. Solution: What you need to do first is to check if the fast charging mode of your phone is enabled. To do this go to Settings – General – Battery then make sure there is a check mark in fast charging. Once you have done this and your phone still charges slowly then try replacing the USB cord that you are using but retain the current wall charger. If the problem persists then try using a different fast charger. If your phone still charges slowly then back up your phone data and do a factory reset. Once the factory reset is finished check the charging status of your phone. If there is no change then this may already be a hardware related problem. You should bring your phone to an authorized service center and have it checked. Hi have note 4 its not Charging after dropped in water dried it out but not holding Charge keeps saying battery less than1% this is even though this is brand new Battery please help 19/10/2017. 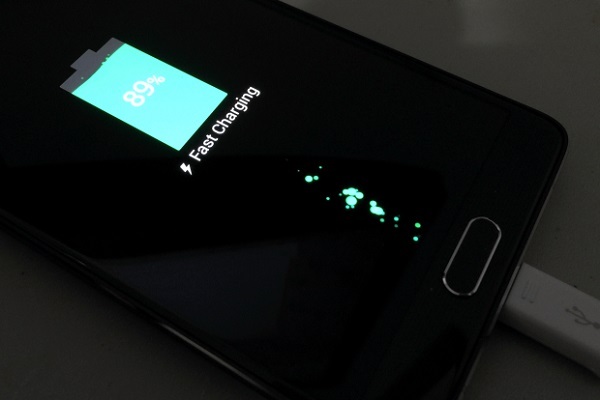 Why note 4 ( os 6.01) ; cannot be charge by power bank ( o/p : 5v; 2.1A)? Hello please tell my why fast charging on my galaxy note 4 isn’t even in the settings, battery section? my galaxy note only charges (ever so slightly) when connected to my computer. it does not charge with the stock charger and others. PLS HALP…. The same thing happened to me this morning, did you have an answer back?